Luckily for her, there indeed is a better answer! 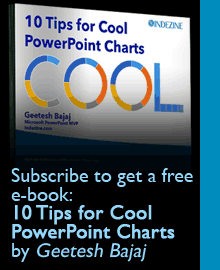 Follow these steps using either PowerPoint 2013 or PowerPoint 2010. Some versions of PowerPoint 2016 do not provide these options, but do try and see if it works for you! Open your presentation that has 500 slides, or any number of slides. Save it quickly by pressing the Ctrl+S keyboard shortcut. Next, PowerPoint 2013 and 2016 users will choose the File | Share | Publish Slides option, as shown in Figure 1, below. If you are using PowerPoint 2010, you will choose the File | Save & Send | Publish Slides option. Next click the Publish Slides button. This brings up the Publish Slides dialog, shown below in Figure 2. This dialog box is essentially meant to publish slides to SharePoint slide libraries. But a little-known trick lets you publish to a local folder too, as single-slide PowerPoint presentations. Click the Select All button highlighted in blue. Then click the Browse button (area highlighted in red) to select a folder to save to. By default, PowerPoint will choose your default Slide Library folder, which typically is:C:\Users\\AppData\Roaming\Microsoft\PowerPoint\My Slide Libraries, but you can choose any other folder. It’s a good idea to choose a new, empty folder. Then click the Publish button, highlighted in green. PowerPoint will now save all your slides as single-slide presentations!